It was a tough few days for the local college sides on the national stage. Heading into the postseason the SFU Clan, UBC Thunderbirds, and Capilano Blues all had high hopes of winning gold and bringing national championships back to the lower mainland. All of them fell short and will head back to BC pleased with their regular season accomplishments, but disappointed in how their year came to an end. Simon Fraser University will have a few months to ponder a pile of “what ifs” following their shock second round playoff loss at the hands of last season’s runner’s-up Cal Poly Pomona. The number one seeded Clan fell at their first hurdle, but will look back at their match against the 5th seeds in the West and wonder how they were unable to find a way through a well organised Pomona backline and move on to the next round. Hosting in Seattle, SFU played out a 0-0 game with Cal Poly after 90 minutes and two 10 minute periods of extra time, despite outshooting their visitors by 12 shots to 4. That took the game to penalties and the Clan looked well on their way to the third round when Brandon Watson brilliantly saved Cal Poly’s first two spot kicks. 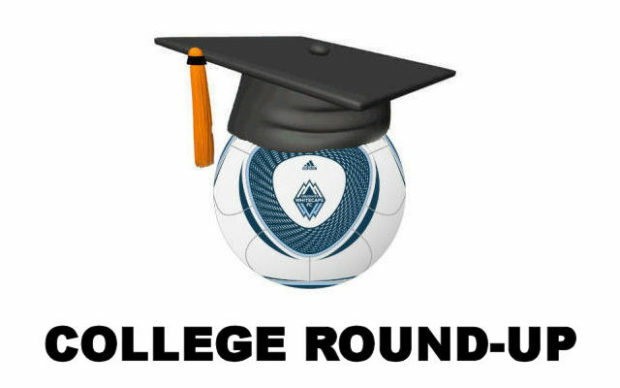 Whitecaps Residency alumni Kyle Jones buried SFU’s first penalty but GNAC player of the Year Adam Jones saw his kick well saved by Cal Poly keeper Jason Trejos to give SFU a narrow lead after the first two rounds. Cal Poly buried their next three penalties, while Mamadi Camara and Magnus Kristensen replied for SFU. German defender Pascal Schmidt was tasked with firing SFU through to the next round but Trejos saved again to set up sudden death. Ori Kenett scored Cal Poly’s sixth penalty to give them a shock 4-3 lead, and when Trejos pulled off his third fantastic save of the shootout to deny Ryan Dhillon, SFU’s excellent season had come to an unexpected early end. As we covered on Friday, it was a great year for SFU, losing just one game in the regular season and sweeping the individual GNAC honours, but they’ll definitely feel they could have made a strong run to the NCAA D2 Final Four in Kansas City and would have had a real shot at landing that first national championship. UBC Thunderbirds will also be left feeling they could have done more at the nationals after also crashing out in the first round in Guelph, Ontario on Thursday afternoon. The 5th seeded Thunderbirds and 4th seeded Quebec A Montreal Citadins played out an end to end quarter-final match that finished 2-2 after normal time and was eventually settled in the 104th minute after the UQAM pounced on a defensive mistake to allow Simon-Pierre Kougnima to fire home the winner. The first half was a cracker and UBC got off to the perfect start when Kerman Pannu fired home the opener just three minutes in, but the RSEQ champions hit back with goals in the 22nd and 39th minute, before Zach Verhoven blasted the Thunderbirds back level with three minutes of the half remaining. Despite both team pressing hard, there were no further goals, although UBC had a lucky escape when UQAM saw a shot crash off the bar and then the rebound cleared off the goalline, but their luck eventually ran out in extra time and the wait for a 13th national title continues, although their week wasn’t over. Goals from Lucas Reis, Titouan Chopin, and Luke Griffin gave UBC a 3-0 win over Acadia in Friday’s consolation final, and the Thunderbirds clinched 5th place when Ryan Arthur scored with 35 seconds remaining to give them a 2-1 win over York on Saturday. There was Canada West glory in the Championship game, however, when Ajay Khabra’s 58th minute goal gave Tim Hickson’s Alberta Golden Bear a 1-0 win over UQAM to clinch their first CIS Championship since 2006 and their third overall. On the women’s side, the defending champions UBC Thunderbirds nearly made it back to back titles but lost a heartbreaker to Laval, going down to an 88th minute winner in Wolfville, Nova Scotia. Capilano Blues headed into Fort McMurray for the Canadian Collegiate Athletic Association (CCAA) championship in confident mood after clinching back to back PACWEST titles in an unbeaten season, and with head coach Paul Dailly being named CCAA Coach of the Year. Capilano got off to the perfect start on Wednesday with a 4-0 hammering of Holland Hurricanes thanks to goals from Kristian Yli-Hietenan, Nicolas Morello, Edris Najm, and Christian Bita. That set up a semi-final with the hosting Keyano College Huskies on Thursday, but the Blues were shocked 3-1, falling to their only defeat of the season (with Morello getting Cap’s goal from the spot with 15 minutes remaining). Capilano got back to winning ways on Friday hammering Dynamiques de Sainte-Foy 4-0 in their bronze medal semi-final, thanks to a brace from leading scorer Mark Jackson, one from Devan Woolley, and another penalty from Morello. That set up a bronze medal showdown with Algonquin Thunder and it was a cracker of a match. Capilano raced out to a two goal lead by the 22nd minute mark thanks to goals from Kamyar Amini and Jackson. Algonquin pulled one back four minutes before half time and tied things up five minutes from full time. With the game seemingly heading for an extra 30 minutes, Najm buried a free kick with two minutes remaining to ensure Capilano headed home with a medal and a 3-2 victory. PACWEST runner’s up Douglas Royals also headed to Alberta for the championship, but lost their preliminary match against Keyano Huskies 3-2, before losing their consolation semi-final 4-1 to Holland Hurricanes, eventually finishing 7th after seeing off SAIT Trojans in their final placement match. Humber Hawks made it back to back national titles, seeing off the Huskies 2-0 in the Championship game. The Douglas College Women’s Soccer Team winning a bronze not worthy of a mention? !